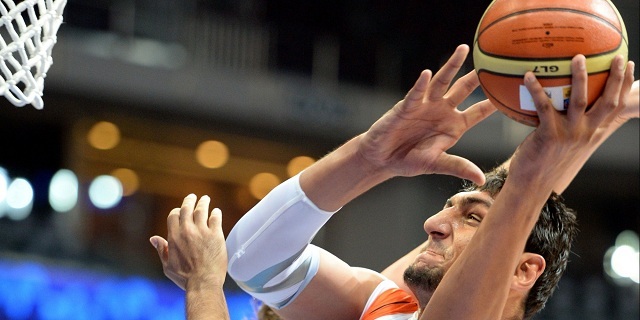 Satnam Singh Bhamara is the name that has taken the Indian sports scenario by a storm. 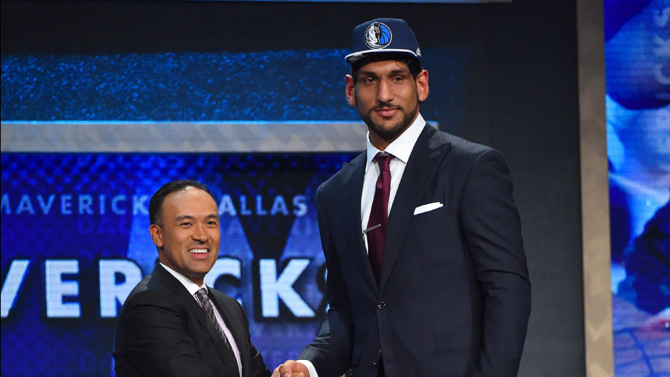 He is the first player from India to be drafted into basketball’s biggest name, the NBA. The simple boy who lived his childhood in a village of Punjab, India, has been chosen by the Mavericks with the 52nd overall pick in the 2nd draft of 2015. The 19 year has been gifted with a rare height of 7 ft 2 in, and going by the common belief, people are convinced that his unique physical feature has helped him steal the spotlight. But, is it just his height? Basketball is one of the most popular sports on earth, and NBA, among the greatest leagues. It takes coordination, speed, agility, focus, ambition, confidence, talent, diligence, and a lot more. For decades, the sport has served as social glue for the American people, enforcing ideas of equality, fairness, camaraderie, teamwork, etc. and has even become a part of the popular culture, with several films and soaps portraying heart-touching stories of how youngsters battle adversities and find a place in the world of sports through talent and perseverance. There’s one thing common in all these stories: there’s always one person who recognizes the talent of the budding hoopster, and encourages him to play. Satnam’s story is nothing short of fiction, as he succeeded to take the first big leap in living his big basketball dream – with the help of a few people in his life. Satnam was born in a small village named Ballo Ke, located close to the border of Pakistan, to a family of farmers. His family’s house is four miles away from the closest paved road. His father, Balbir, too, has a height of 7-2, something he seems to have given to his son. 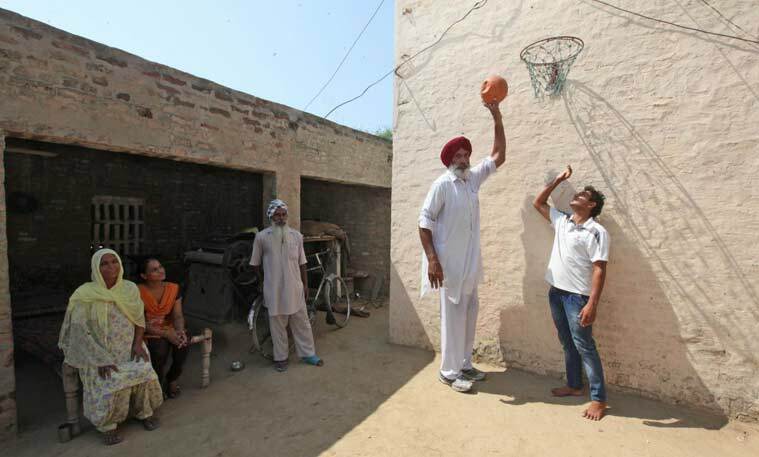 When Balbir was still a child, he became the tallest person in the village, and everyone advised that he should play basketball. However, there was neither any facility to train in the sport where the family lived, nor was there any prospect. It would probably have been different if the sport in question was cricket, or at least soccer or field hockey. But this was basketball, in which very few are interested in India. 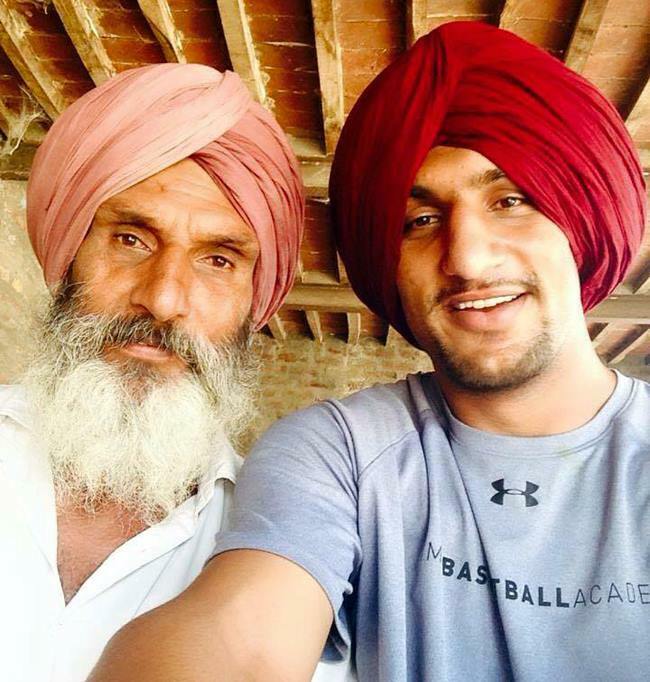 Balbir’s father refused to allow him to pursue the sport, and wanted him to become a wheat farmer and miller. Satnam’s father remained in their hometown, and soon became the head of the village. He got married to Sukhwinder Kaur, and had three children, the middle child being Satnam. As Satnam started growing up, he showed the same physical feature as his father. At nine, he became taller than most people in the village. That’s when Balbir decided to let Satnam do what he himself couldn’t – use his great height as an advantage and gain leverage in basketball. With little understanding of the game, he still took his son to the local basketball court. At first, Satnam was confused – he thought he was being taken to play volleyball. Needless to say, he struggled with the sport. But, Balbir installed a hoop in a courtyard near the house, and Satnam started practicing there, drawing the interest of the villagers. The onlookers would say that the enormous basketball seemingly shrank in size when the rapidly growing giant-boy held it in his hands. So, they started calling him Chhotu, meaning the ‘little one’ in native tongue. Satnam’s growing interest in the sport compelled Balbir to look for players and coaches in Punjab who would help him. Soon, he was seen in various youth leagues in Punjab, crushing his opponents. An enthusiastic Balbir urged a 10-year old Satnam to enroll in the Ludhiana Basketball Academy, which is designed to nurture young talents between 14 and 18 years of age, from Punjab and its neighbouring regions. Satnam made the cut, even though he was only 10. Satnam received his first lessons in basketball skills and drills at the LBA from former basketball coach of Punjab and Sports Authority of India director, Dr. Sankaran Subramanian. Today, when Satnam looks back, he gets emotional thinking how Subramanian once had the dream that one of his students would someday make it to the NBA. He recognized Satnam’s talent and believed in him. He always encouraged the boy to follow his heart. Who knew back then that both their dreams would be realized? By the time he grew 13, Satnam was already a boy of a massive height of 6-11, who wore size-18 shoes. But is physique was not the only thing that was growing. As he started watching NBA, he would get inspired by players like Kobe Bryant and LeBron James, and modeling his games off of Dwight Howard, Shaquille O’Neal and Yao Ming. Outside the NBA, Ludhiana Alum Jagdeep Singh Bains was another role model for him. In 2010, New York-based sports and media business, IMG, decided to partner with Reliance Industries in India to form IMG Reliance, and create a sports and entertainment marketing company. Their first move was to enter a contract with the Basketball Federation of India, and in order to improve facilities and leagues in India, they took the initiative to allow athletes to attend IMG Academy in Brendon on a full scholarship. The same year, Satnam led his junior state team to a national championship, and the BFI chose him to play at the NBA Basketball Without Borders camp in Singapore. The head of BFI, Harish Sharma, saw the dormant talent in Satnam, and had the towering 14 yer old play against the members if the national team of the country. Satnam managed to compete with them. He recommended the boy to IMGR to consider him for a scholarship. But, at the age of 14, he was too old for it. Meanwhile, Singh had also caught the eyes of another person. Director of basketball operations for the NBA in India, Troy Justice, saw him play in the NBA Mahindra Challenge. Singh was growing so fast that he was playing in shoes that were falling apart. Justice noticed how the seams had split, but that was all he had. Justice helped Satnam acquire a new pair of shoes. He knew that if someone could be chosen from India, it was this boy. Finally, he was offered a scholarship from IMGR basketball academy. Near the third quarter of the whirlwind year, Satnam found himself moving to Bradenton, Florida, as one of the 29 student-athletes, both male and female, to be selected to train at IMG Academy. But, this was not the end of Singh’s hurdles. The village-boy from India was unable to cope up with the lessons, because he knew no English at that time. He also lacked primary school education. As a result, going to college or receiving scholarships to play in the National Collegiate Athletic Association was out of question. But he concentrated on honing his skill in the only thing he knew: basketball with academy coaches Kenny Natt and Daniel J. Barto. For five years, that’s what he did. Daniel, who had played an instrumental role in bringing him to the land of his dreams and facilitating his trip, worked on him to transform the raw talent into a polished athlete. Kenny kept him focused and calm, even on the night before the draft. Less than three months after Canadian-born Sim Bhullar became the first player of Indian origin to make it through to the NBA as he featured for the Sacramento Kings briefly, Singh was picked by the Mavericks. 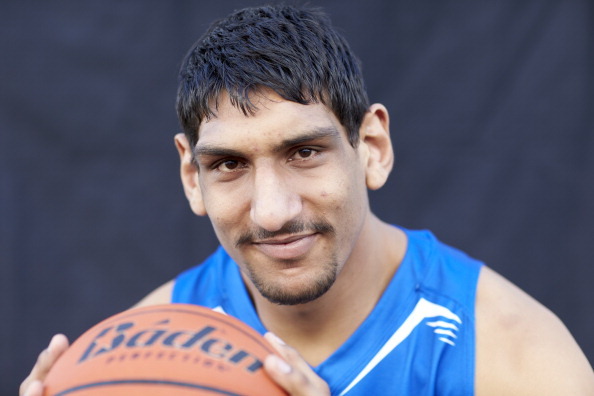 Satnam Singh Bhamara created history. 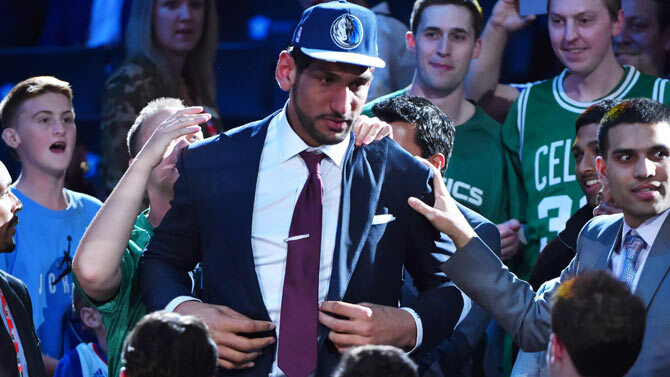 He became not only the first Indian-born player to be drafted at the NBA, but is also the first since 2005 to enter the draft without playing in college. Satnam remembers the contributions of each and every person in his life, from his family to his coaches, and even the players. He believes that his stint at the NBA will open up new avenues for other Indians who will be inspired to explore the world of sports outside the common cricket. Today, Satnam still struggles with English, but he has come a long way. His elder sister, Sarbjot, remembers how he hated English in school, and tore 108 books till standard V. The overgrown, shy boy, who had to be walked to school, hand-in-hand, by his sister, and made the onlookers burst out laughing, is brushing shoulders with the best in the business today. His younger brother, Beant, has a funnier memory of how he would often forget to brush his teeth, because as a boy from a village, he did not have the habit of using brush and toothpaste. But the day Satnam sent back a photograph of himself visiting a dentist, everyone realized that he had made it. 19-year young prodigy Satnam is now able to communicate in English, and does not think that language can be a strong enough barrier to stop him. He has now learnt to take care of himself. He now Skypes and Tweets, and addresses the press. The large, misfit boy now blends perfectly in a place where he belongs, where his talent is recognized. 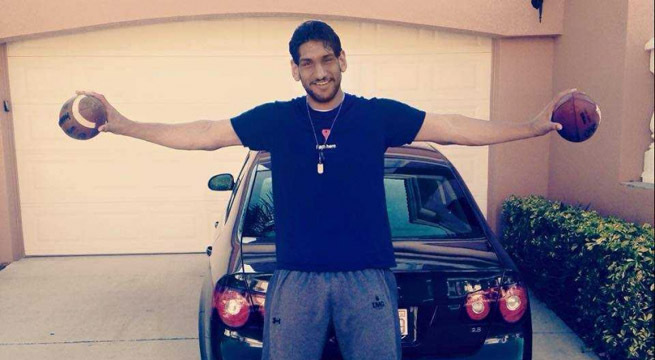 Satnam Singh Bhamara has not only grown large, but has grown up, and is growing big. He now has his own hoop-dream story. He is aiming for the sky. Meher Moos: the solo woman traveler with 18 passports!